Three-year-old British girl Madeleine McCann was abducted from a Mark Warner resort in Portugal's popular holiday area, the Algarve. The holiday firm had just one chalet when it began 33 years ago, but now takes about 50,000 people abroad every year, and has developed a family-friendly reputation. The Ocean Club in the village of Praia da Luz is Mark Warner's only resort in Portugal. 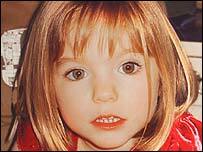 It was from an apartment there that Madeleine McCann, from Leicestershire, was taken on Thursday evening. The resort offers babysitting and creche services but Madeleine's parents, Gerry and Kate, dining just yards away, were popping back regularly to check on their three children. Mark Warner describes the Ocean Club as offering individual villa-style accommodation, set around a series of private areas with their own pool and bar, cafe, and restaurant facilities. Its childcare services include a creche with an outdoor play area, and nannies who organise supervised activities for children. There is also babysitting, and a "dining-out" creche service in the evenings for children aged four months to nine years - parents eating in the resort's restaurants drop the children off and pick them up later. Prices for a fortnight at Ocean Club rise to £1,675 per adult at the height of the season. Paul and Susan Moyse, who are regular holidaymakers at Ocean Club, have always regarded the resort as a safe place. Mr Moyse said: "It's an idyllic resort. Fantastic place." Mrs Moyse added: "It's paradise. Nothing ever happens here, never." Simon Calder, travel editor for the Independent newspaper, says Mark Warner has developed a reputation for "extremely family-friendly" holidays, offering "everything from giving face-painting classes to younger children, to teaching older children snorkelling and windsurfing". "It's not quite an all-inclusive resort in the traditional sense but it is a very relaxed, very British-focused place, English-speaking staff - many of them have professional child-care qualifications," he said. He added: "The situation at the Ocean Club in Portugal is that this is part of a larger complex, so it's not exclusively Mark Warner, but what the company does provide is a couple of services. "First of all they've got something called a drop-off creche which means if you're dining in one of the resort restaurants you just leave your children there. "A lot of parents will think 'Well, we don't actually want to do that because we don't want to disturb them when we're taking them home'. "There is also baby-sitting available at an extra charge." Mr Calder said Mark Warner had a "flawless record", and like any British tour operator had a legal and moral obligation to keep the highest standards. "But this is a holiday resort, it's not a prison camp. This is somewhere where people go to relax and it is a very lovely part of the world," he said. "You can completely understand people maybe being off their guard, and certainly you don't get the high fences that you might find in some other resorts with security guards, simply because nobody would imagine you would ever need them." James Wilkinson and his wife, from Chorleywood, Hertfordshire, will be going to Mark Warner in Greece for the fourth year running this summer, with their two children aged four and two. Mr Wilkinson said: "Mark Warner is a fantastic family holiday where parents can get some time to themselves. "The facilities for the children are probably better than the facilities for the adults. They know if the children are happy the parents will be happy. 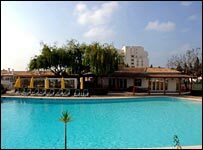 "What I do know about this Portugal resort is it is quite different from other Mark Warner resorts. "All the resorts we've been to have been pretty much self-contained and away from the local town. "I've never once had any concern at all about safety and security." Mark Warner was founded in 1974 with just one chalet in the Swiss ski resort of Verbier. Originally the idea was to offer activity-based breaks for adults, but over the years facilities have been developed to improve accommodation and offer better childcare. Its summer destinations feature 10 beach resorts in Corsica, Egypt, Greece, Portugal, Mauritius, Sardinia and Sri Lanka, plus two in the French Alps. 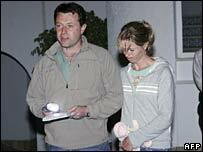 The firm, which is based in London, says it is committed to doing all it can to support the McCanns. It has sent out two counsellors, while directors of Mark Warner are also in the resort to help "in any way possible".